In the weeks before her debut, Chiyo goes to a hairdresser to have her hair done in the manner of an apprentice geisha. Since geisha wear extremely elaborate and expensive hairstyles, no geisha goes to a hairstylist more than once a week. Washing their hair would ruin the hairstyle, so geisha often hide the odor by wearing perfume in their hair. Auntie also teaches Chiyo how to wear the geisha’s many-layered kimono and put on the traditional makeup. The geisha’s hairstyle is in some ways the most deceptive and artificial part of her outfit. Though beautiful, the hair itself is dirty and various perfumes are used to conceal its smell. In this way, we can see how the geisha’s physical beauty is more artifice than truth. Finally, the day comes when Mameha and Chiyo perform the ceremony binding them as sisters. The ceremony takes place at a teahouse where a maid brings out a tray with several sake cups. First Chiyo takes three sips from a cup, and then Mameha takes three sips. They do this for three different cups. From this moment on, Chiyo is known as the geisha Sayuri. The simplicity of the ceremony illustrates that the bonds between people entail more than just simple ritual. To be real sisters, two women must do more than just drink out of the same cup – they must also relate to each other with love and empathy. Mameha’s fortuneteller had helped picked out the name “Sayuri.” The name comes from the characters sa, meaning “together,” yu, from the zodiac sign for the hen (in order “to balance the water elements in her personality”), and ri, meaning “understanding.” Sayuri feels odd about her new name, because it feels as if a little girl named Chiyo has been destroyed by the young woman Sayuri. Taking on a new name symbolically marks Chiyo’s transition into adulthood. As she becomes the adult Sayuri, the child Chiyo (in some ways) disappears—and she loses any link to her past, giving herself totally over to the beautiful and artificial world of the geisha. The process of picking the name once again shows how geisha traditionally rely on fortunetellers to gain some control over their lives. For the rest of the afternoon, Mameha takes Sayuri around Gion, introducing her to the mistresses at various okiya and teahouses. Though Sayuri is exhausted by the end of it, Mameha tells her to prepare for tonight when they will be entertaining men at a party. Sayuri returns to her okiya to bathe and dress for the event. Mameha’s presentation of Sayuri to the head women in the geisha society again shows how women, rather than men, are in charge of geisha culture. In this sexist and oppressive society (at least as Golden portrays it), becoming a geisha is one of the few ways for women to gain some autonomy. At the party, the men drink heavily, tell jokes, and listen to the geisha tell humorous, somewhat suggestive stories. Mameha tells a story about a male wig maker who overheard her urinate and then wrote her a love letter about “the beautiful tinkling sound more lovely than a waterfall.” After Mameha concludes the story, Pumpkin and Hatsumomo come into the teahouse and sit down with the group. Whether these stories are true or not doesn’t matter—what matters is that they entertain the men. In essence, the geisha’s job is not to tell the truth, but to entertain. As a result, this scene acts as commentary on the nature of storytelling: entertainment is often more important than truth. Perhaps, then, Sayuri in the present isn’t telling the full truth of her memoirs either—she may be embellishing the truth to make a better story. 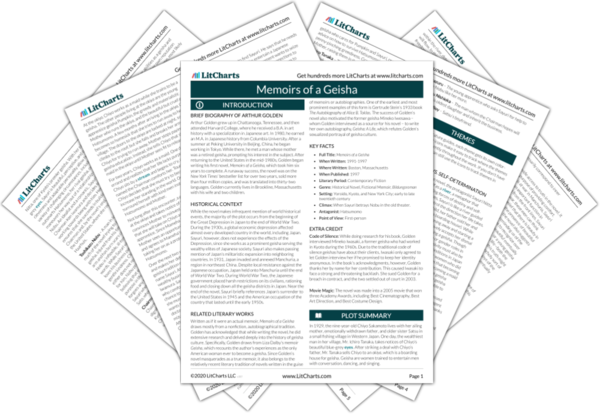 On a more “meta-narrative” level, this idea could be used to interpret Golden’s writing as well—he might be exaggerating or embellishing parts of geisha culture to entertain his Western readers. Plaue, Ethan. "Memoirs of a Geisha Chapter 14." LitCharts. LitCharts LLC, 4 Nov 2015. Web. 18 Apr 2019. Plaue, Ethan. "Memoirs of a Geisha Chapter 14." LitCharts LLC, November 4, 2015. 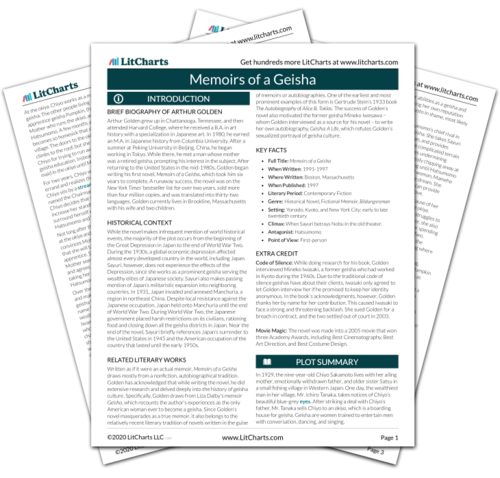 Retrieved April 18, 2019. https://www.litcharts.com/lit/memoirs-of-a-geisha/chapter-14.